‘Abusive’ Britain First supporter David Davis ran at a police line and shoved an officer in the chest during a far-right protest. The 20-year-old attended the Burslem protest which was organised by Stoke-on-Trent Infidels and featured Britain First leaders Paul Golding and Jayda Fransen. But the father-of-one became angry when a counter-protester threw a firework towards the Swan Square crowd during the ‘rally against grooming’ demonstration. Now Davis, of Leek New Road, Cobridge, has admitted assaulting PC Stuart Fellhouse. North Staffordshire Justice Centre heard the rally took place on October 28. 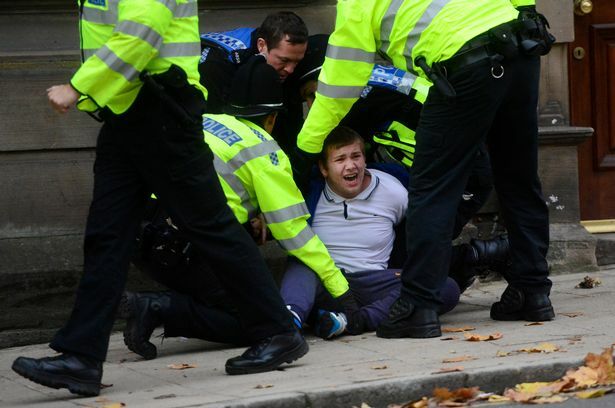 Police have previously stressed more arrests will be made following last month’s protest. “Davis pushed the PC with both his hands in the middle of the chest before jumping back into the crowd. 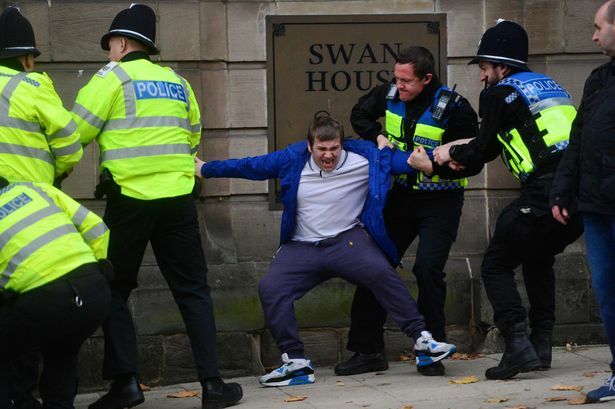 He was then put on the floor by another officer and arrested. Scott Ashdown, mitigating, told the court that the defendant has started an anger management course. He is already subject to a 12-month community order for a racially-motivated offence and has been working with the probation service. PC Fellhouse was not injured in the incident and called for a community order to teach him about other beliefs and cultures. The defendant was handed a 12-month community order. Davis must also pay £135 court costs, an £85 victim surcharge, a £50 fine, and £30 compensation to PC Fellhouse.